The gully cuts from west to east through the rim of Endeavour Crater, where the rover has been exploring for several years now, and is about as long as two football fields. It is currently about half a mile from the rover, which is making its way along the rim a bit farther north. 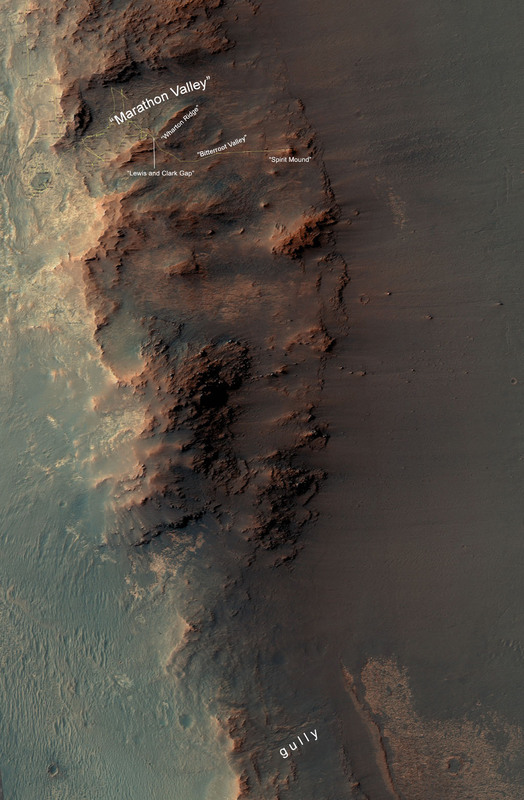 Scientists think this gully was carved by water (although a long time ago), similar to other gullies and old riverbeds seen in many locations on Mars. A gully like this has never been seen up close before – only by spacecraft in orbit—so it will be an exciting “first look” for the rover team. 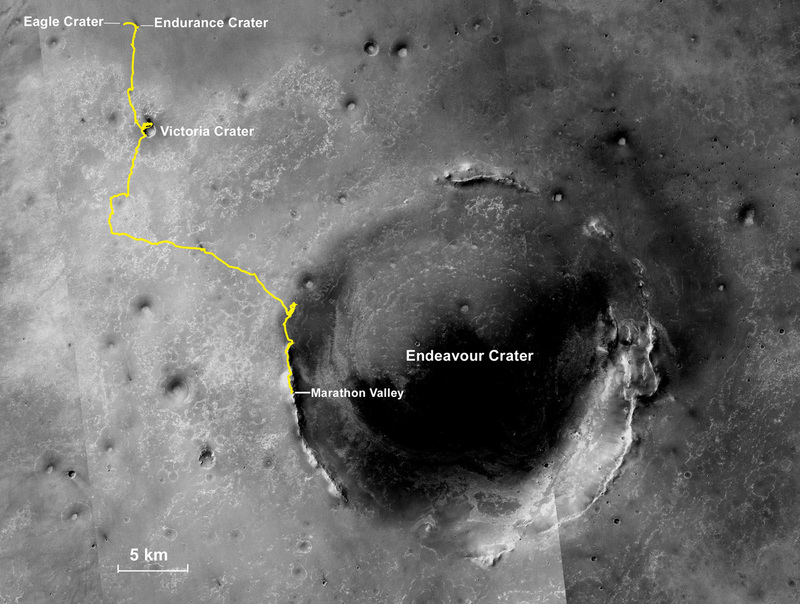 Opportunity will drive down the entire length of the gully, onto the crater floor below. This is part of a two-year extended mission for the rover, which began Oct. 1. Opportunity’s prime mission ended in April 2004, and has been extended multiple times since then. Opportunity has been on the western rim of Endeavour Crater for a long time now, after first reaching it in 2011, gradually making its way southward. It has approached the crater bottom before, but has never gone fully in. Endeavour Crater is huge, at 22 kilometres (14 miles) in diameter. So what does the mission team expect or hope to find in the gully? Closeup view of Spirit Mound, overlooking the floor of Endeavour Crater. Image Credit: NASA/JPL-Caltech/Cornell/Arizona State Univ. As of right now, the rover is at a rock outcrop overlooking the crater floor called Spirit Mound, just outside of Marathon Valley and near the east end of Bitterroot Valley. Last month, the rover drove through the Lewis and Clark Gap, a shallow point in the wall separating Marathon Valley from Bitterroot Valley. Recently, the rover had been busy examining rocks in Marathon Valley, another geologic cut through the crater rim, but it is a valley, not a gully or riverbed. It does, however, contain clay minerals, which are also evidence for past water in the region, perhaps groundwater. That water would also have been less acidic or salty than in other regions of Meridiani Planum away from Endeavour Crater, where Opportunity landed in 2004. Upon closer examination, the clays were found to be present in reddish streaks, and the material was very weathered and crumbly. While the newer Curiosity rover has a drill to penetrate several centimeters into rocks, Opportunity has the RAT, which can grind into just the surface layers of rocks. Wharton Ridge, on the southern wall of Marathon Valley. The image is in enhanced color to help make surface details more visible. Image Credit: NASA/JPL-Caltech/Cornell/Arizona State Univ. 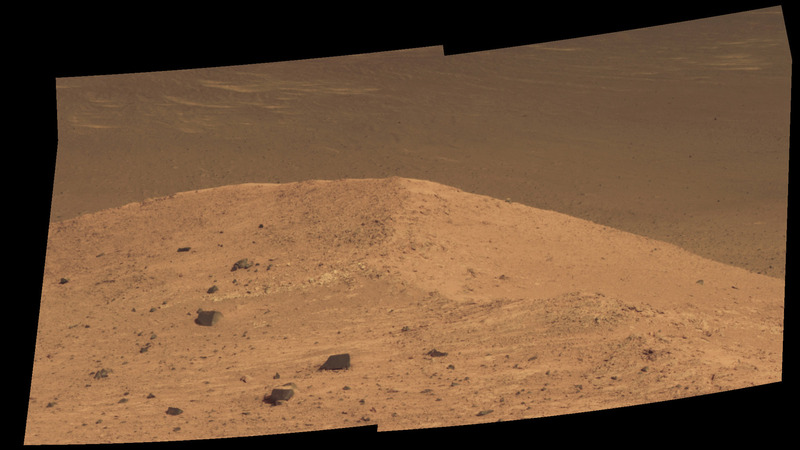 On the southern edge of Marathon Valley, Opportunity had also climbed a steep slope called Knudsen Ridge. Knudsen Ridge is a great look-out point, overlooking the vast floor of Endeavour Crater. It was named after Danish astrophysicist and planetary scientist Jens Martin Knudsen (1930-2005), who was a founding member of the science team for both Opportunity and its twin rover Spirit. The rover handled the terrain well. Before that, the rover climbed to the top of Cape Tribulation on the same side of Endeavour Crater, which is 1,390 metres (4,560 feet) tall, the highest point on the rim of the crater. The view from this vantage point was spectacular. Opportunity also found high levels of sulfur in a wheel scuff made by the rover in the surface material. Opportunity also saw a large dust devil not too long ago, which is a rare occurrence. 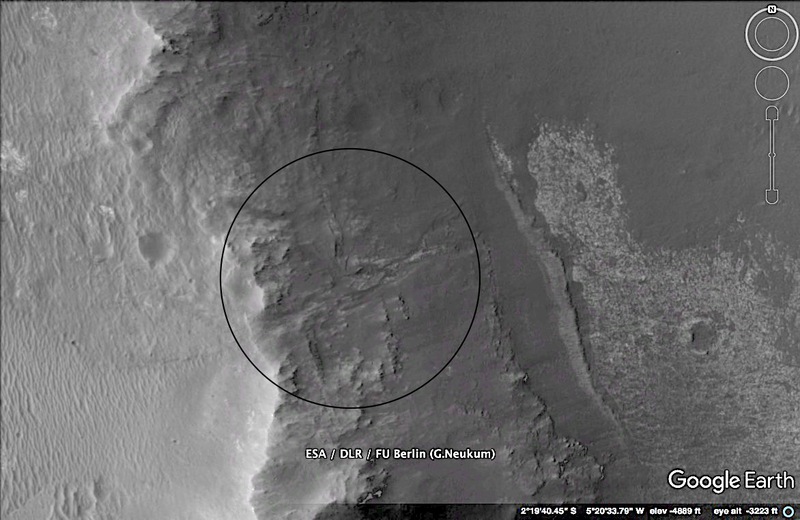 Its twin rover, Spirit, however, saw many of them in Gusev Crater before it stopped functioning in 2009. The longevity of this mission has been incredible. When the rover first landed in 2004, it was hoped to last three months. Now it is late 2016 and the mission is still going strong! Opportunity has survived seven Martian winters so far, and in 2017 will face its eighth. More information about the Opportunity mission, as well as its now-defunct twin rover Spirit, is available here.